With so many people carrying their mobile phones with them 24-hours a day - text message marketing is a hugely effective way to promote nightclubs, lounges, and comedy clubs. Because every message sent is read by the recipient - it's a great way to get your message across! 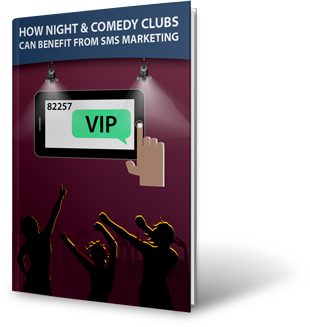 "SMS marketing works better than all other marketing channels combined" - The Improv Comedy Club. Send Invites to Mobile Phones - Collect numbers either by incoming texts from printed materials or at your venue, and then send out direct marketing campaigns to your clients' mobile phones at any time. Queue Jumping Invites- Text queue jumper tickets directly to mobile phones. Recipients show their phone with the text message showing on the screen to the doorman, and get in.